There is a new magazine in town. It's name is Baked & Delicious and the recipes inside certainly are. The magazine comes out twice a month on a Thursday. The first issue is available at the special price of 99p and comes with silicone cupcake cases, but as the series goes on you can collect a brush & spatula, a loaf pan, a quiche case. heart shaped moulds, mini muffin cases and petit four cases. The second issue comes in at £2.99 all the issues after that are £4.99. 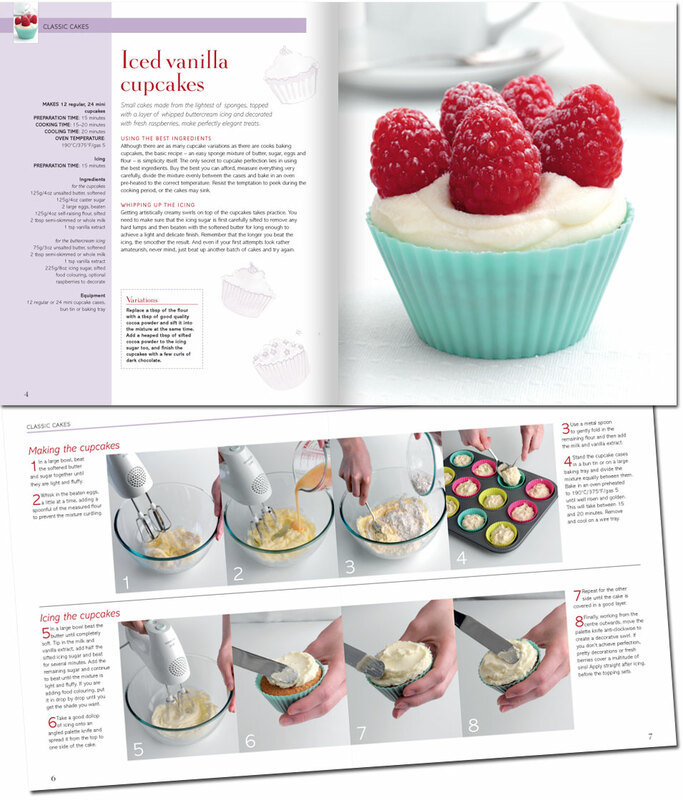 There is also recipes for Iced Vanilla Cupcakes, Rosemary & Thyme Focaccia, Macaroons, Mediterranean Tartlets, Lebkuchen, Dundee Cake, Bitter Chocolate Puddings and a recipe for Choux Buns. I decided to start easy and try the choux buns. I have always been a bit scared of making choux pastry, so I have avoided it like the plague. Then I saw Raymond Blanc making some choux pastry on tv and he made it look easy, so when I saw the recipe in Baked & Delicious I decided to give it a go. And, amazingly, they were easy to make. 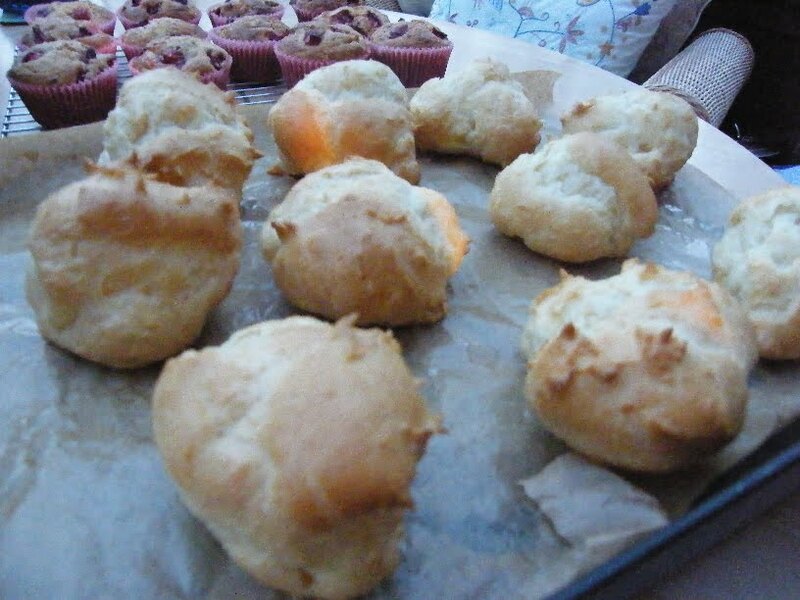 I made small choux buns, using a teaspoon to dollop them onto the tray, instead of piping them, but when they came out the oven they were monsters. I am going to fill them with cream and dip them in chocolate to turn them into profiteroles, but I have lost my light for taking any decent photos. So, I will leave you with a few photos of my choux buns in preparation and post the recipe and more photos another day. If you would like to try some of the recipes from Baked & Delicious, then why not enter my giveaway. I have 1 set of Baked & Delicious, issues 2 to 5 to give away, along with the free silicone bakeware that come with them, which is a spatula, pastry brush, loaf pan, quiche pan and two pretty heart shaped moulds. To win the set of magazines just leave me a comment. 1. Follow my blog and leave a comment to say you have done so. 2. Follow me on twitter (@tinnedtoms)and leave a comment to say you have done so. 3. Tweet the competition by clicking the twitter button at the end of this post and leave a comment to say you have done so. This giveaway will be open until Friday 8 April 2011 and is open to UK residents only. I had also planned to post the winners of my Slow Cooking Challenge today, but I feel I need a bit more thought before I decide. I will update you on the winners in a couple of days. I think I am going to try a couple of the recipes that I cannot decide between first. And to continue my theme of not getting anything finished. 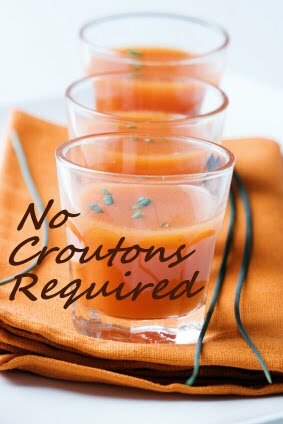 I would like to send my apologies to my good friend Lisa for not getting a recipe done and posted for this month's No Croutons Required. You will be able to catch up with the more productive bloggers, who actually submitted a recipe tomorrow, over at Lisa's Kitchen. Remember to vote for your favourite. That is such a neat idea for a cooking magazine to give out baking necessities like that. 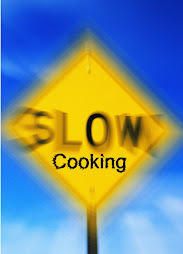 I wanted to let you know that I tried to make a slow-cooker recipe for your event. However, I hardly use my slow cooker and my recipe was a failure. So, I'll be looking forward to your other entries - I could use the help myself! Hi Claire, it is a good idea, isn't it and such good recipes too. I was very impressed with it Marie, but then I am a sucker for baking recipes and love lots of big colourful photos. The slow cooker challenge didn't inspire many recipes, but five including my own, but they are a tasty bunch. Looks like a great magazine! The profiteroles look yummy! I racked and racked my braqin to try and think up a recipe for your slow cooker challenge, I don't actually have one, well I do but it's an Aga...the biggest slow cooker in the world!! But I could think of nothing original, sorry!! I think B&D is a lovely magazine but I fear readers might drop off when it hits full price - £4.99 for a 26 page mag is a lot, even with the free bakeware. I wish they'd offer a cheaper version without the bakeware as I won't pay £4.99 per fortnight for it. This magazine sounds wonderful Jacqueline! I came across another British mag the other day at Chapters "Woman and Home" and made an Ottolenghi recipe just yesterday. I treat many of my magazines like cookbooks. Your profiteroles do sound delicious!! The magazine sounds interesting - I wouldn't mind leafing through the pages and trying out the recipes. 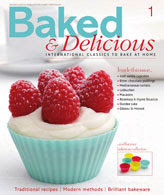 I'd love to improve my baking with this magazine. Sorry, I just made a mistake and linked to your blog instead of mine in my last comment saying that I follow your blog. You can delete it if you like. Looks like a gem of a magazine! Wish I could enter! More giveaways, yipee! I am officially following your blog and I've just tweeted and facebooked myself silly for good measure! thanks for the giveaway! I'd been looking at this magazine on the shelves, but hadn't quite got around to buying it - winning would give me the baking boost I need! now following baked & delicious on facebook! Hooray! I have been trying to follow you all day and have finally added you to my google home page (I'm not a blogger but a fellow veggie so have unoffically followed you a long time).Every where I go this magazine is sold out - it must be good. Thanks for sharing your lovely recipes, it must be difficult to find the time now you have the lovely Cooper - your efforts are appreciated Jacqueline. I already follow your blog, so will now follow you on twitter and tweet about the comp! Great idea - I LOVE silicone bakeware. So much easier not to have to grease and almost indestructible. Plus it can go in the dishwasher -my new best friend. 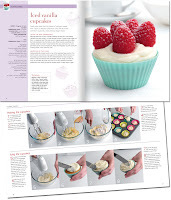 Having got my hands on the 1st issue of this Jac, I would be very keen to have the next four and also keen to get my hands on more silicone bakeware, especially the hearts!